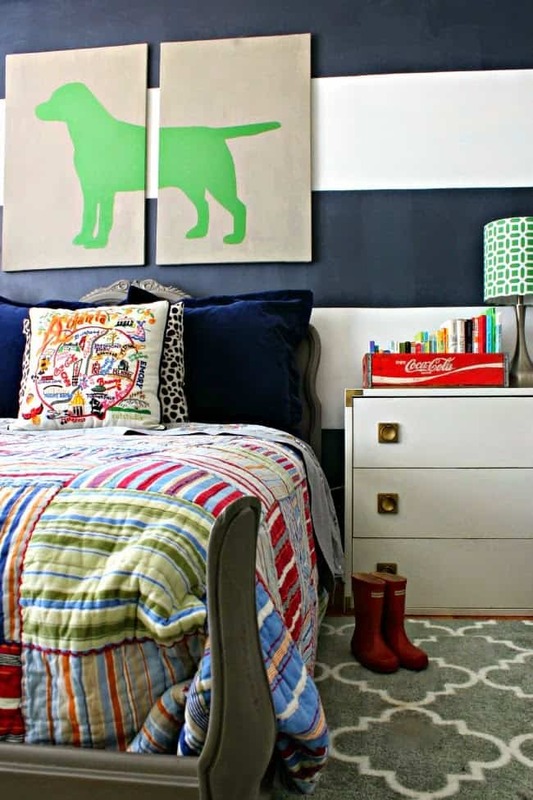 My favorite favorite favorite type of space to decorate and pull together is a kids room. If there’s ever a spot to have fun and bring in the color… it’s a kids space. Also? As much as I *try* to design a space that can ‘grow with’ the child… who are we kidding. As an adult my taste changes every 12 minutes so of COURSE it will be the same for kids! That said, I do my best to build a space that can be easily adapted to growing opinions if that makes any sense. (Think bright bold picture frames that can be swapped out when the love for fuchsia subsides and not a fuchsia signature wall!) Today I’m sharing some of my favorite colorful kids spaces from around the web. Martha’s room in our old house was one of my favorites… this space needed to double as a guest room which was the biggest consideration. The playroom was right outside her door so there was no need for ANY toys in there, which helped keep it a little more neutral for guests. This is where my fun collection of embroidered art used to live, but I personally think it looks a million times cooler in it’s current location at our new house. As much as I loved those rooms in our old house, they came together slowly and sort of haphazardly. The kids’ rooms in our new house didn’t get major transformations, but… they were all designed and fixed up in one fell swoop. I don’t consider Arthur’s room to be all that colorful, but his was the first I tackled since we moved in while I was about 17 months pregnant. 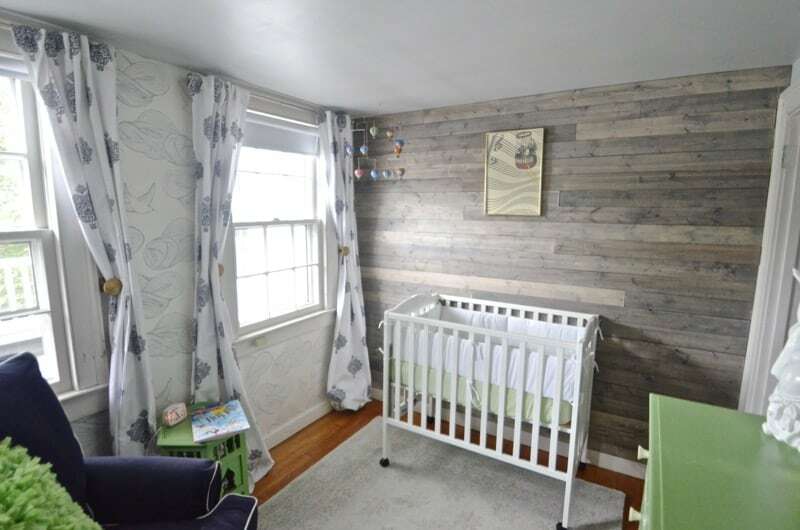 I added a plank accent wall (faux reclaimed wood… tutorial is here), put up wallpaper and painted. The rest is smoke and mirrors! 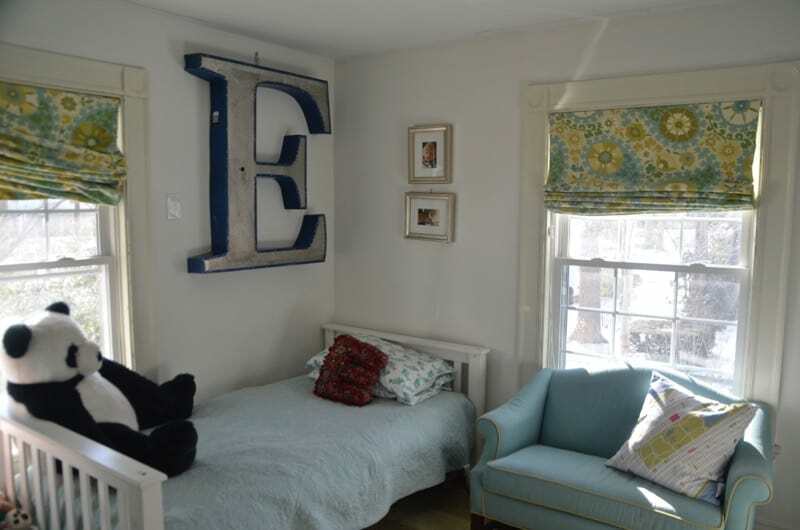 Eleanor’s room was next. 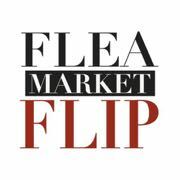 See the reveal here to fully appreciate the color scheme we were dealing with before. Think yellow. Lots and lots of yellow. 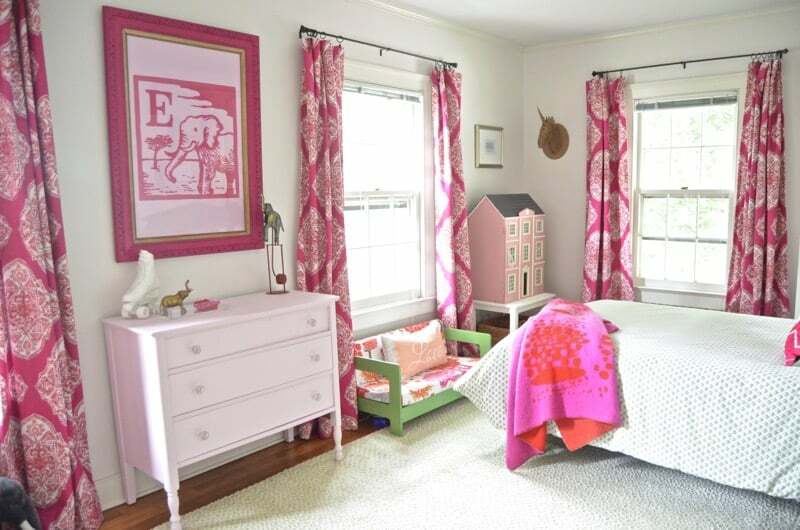 She wanted fuchsia to be a big player in her space and helped pick out the fabric for the curtains. I painted the walls, painted the dresser that used to be in our guest room at the old house and had fun with styling. Again… a few little things were added here and there, but this was all furniture and artwork we had already! Oliver’s room was the easiest. His walls were already that sweet blue. The wall over his bed had some major holes that needed patching so rather than worry about matching the blue paint… I added some very pale stripes. The rest is accessories and textiles. 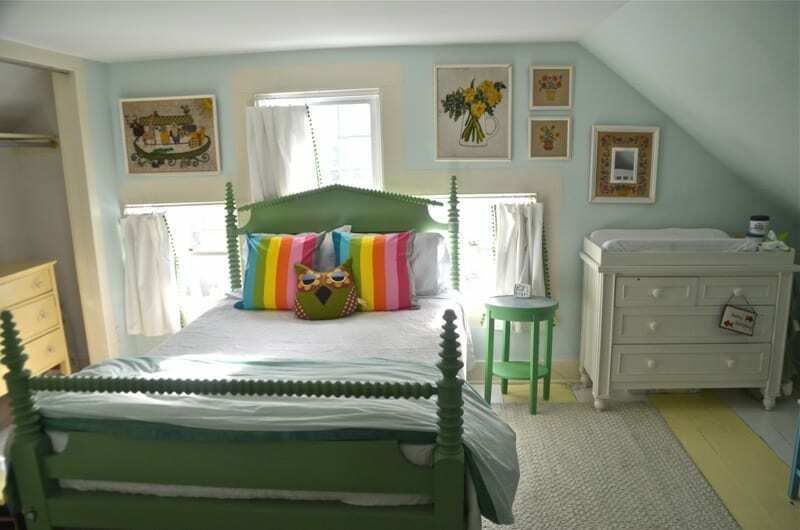 If I had to choose, Louisa’s colorful little room might be my favorite. It has those boho touches that I love! The rug is the star (this one from Rugs USA). Her flea market bookshelf got a bright sunny coat of paint and I DIY’d the tapestry behind her crib (tutorial coming soon). The room was already pink and… why make extra work, right? I added a faux gallery wall over her changing table. We’re getting close to the time when the crib needs to go, but until she can climb out… I leave it alone! 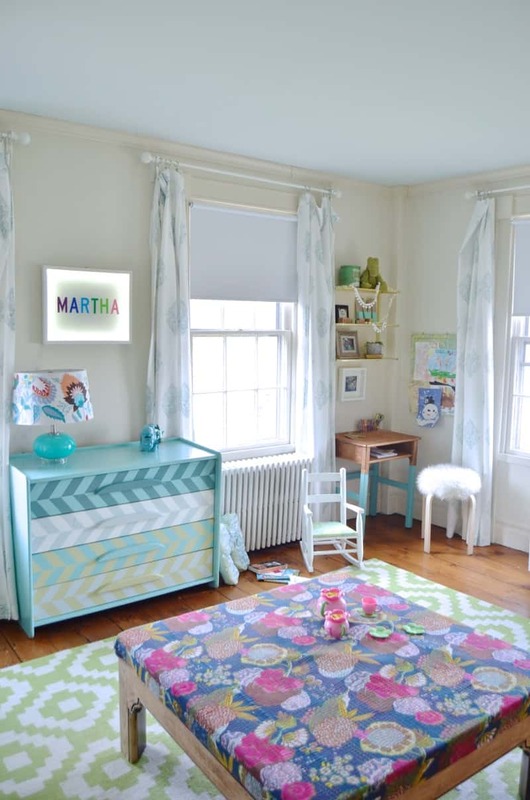 Last but not least, Martha’s room! Again… I definitely didn’t paint in here, but I created a cute little work corner for her. The giant ottoman is one of my favorite coffee table hacks… as I type, it’s been turned into a giant bed for their game of ‘family’. I’m also partial to her light up name sign… it’s the perfect night light for us recently. But enough about me! 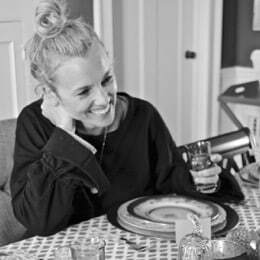 I grabbed lots of my kids room inspiration from talented friends like the ladies below. 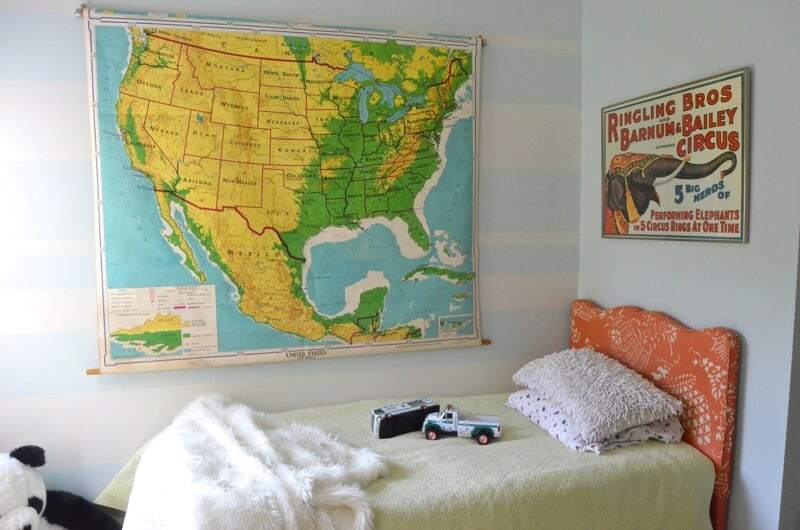 Their kids rooms are some of my favorites so you should DEFinitely go check them all out! My friend Heather from Southern State of Mind mixes preppy into her fun designs like no one else. The artwork over the bed in her son’s room is perfection (and so simple), and I LOVE the more grown up lines of the bedside table juxtaposed with the cute bedding. Not sure how to bring color into a space? Follow my friend Erin Spain’s lead and go for isolated pops of color. 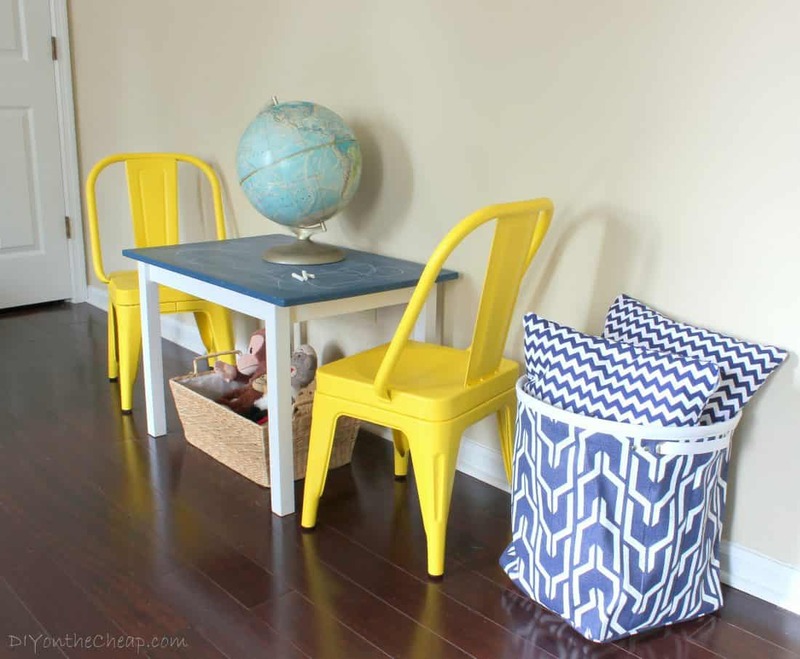 These yellow chairs in her sons’ room make the space! I LOVE the sunny fun vibe they bring into the room. I also love how a bright coat of apple green on a sideboard in the same room immediately ups the ‘cool’ factor on what might be perceived as a more dated piece. 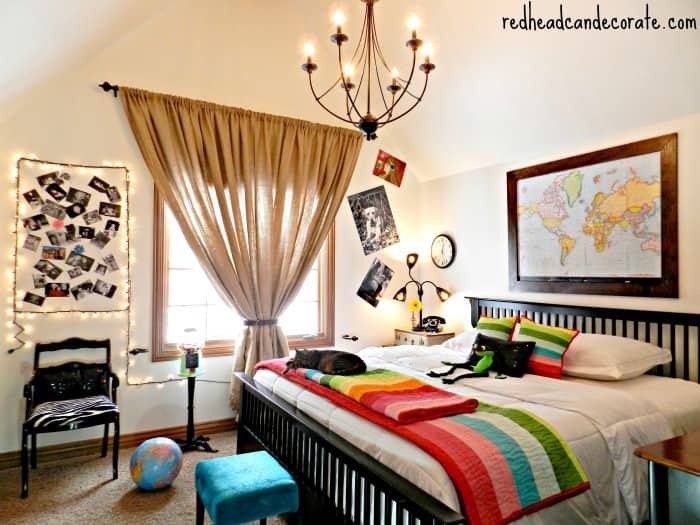 I love the hints of color and whimsy that Julie from Red Head Can Decorate brought into her daughter’s room. When her daughter gets older and outgrows some of the details? SO easy to pare down. That bedding though, right? The best. 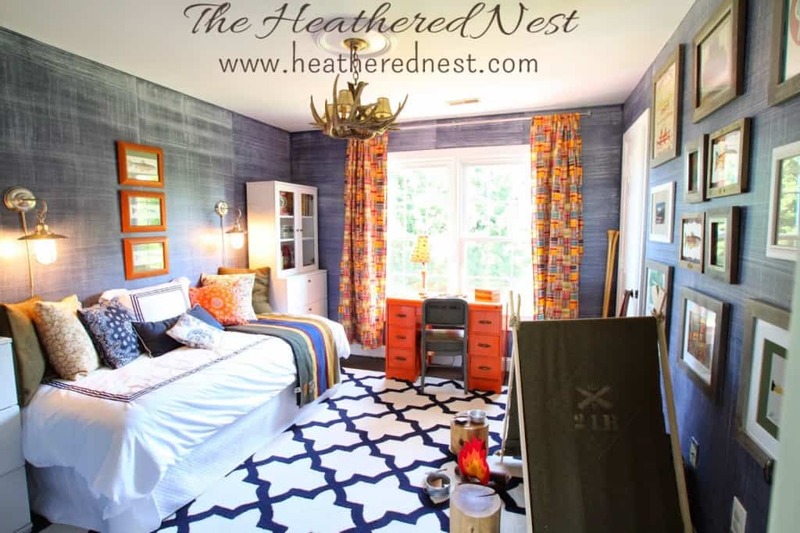 Every time Heather from The Heathered Nest shares her son’s bedroom on social media, my pulse picks up. She DIY’d the walls in her sons room and I swear to you one day I will copy her. 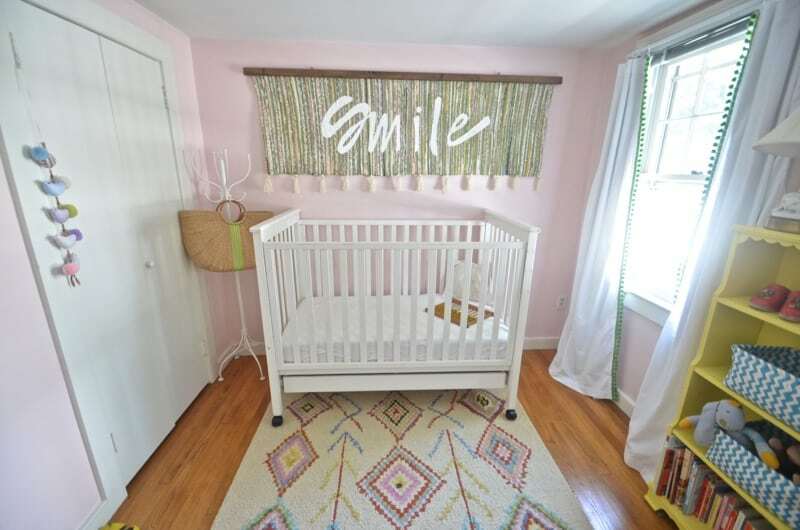 The whole room is adorable, but those walls, man. Those walls have my heart. There you have it! 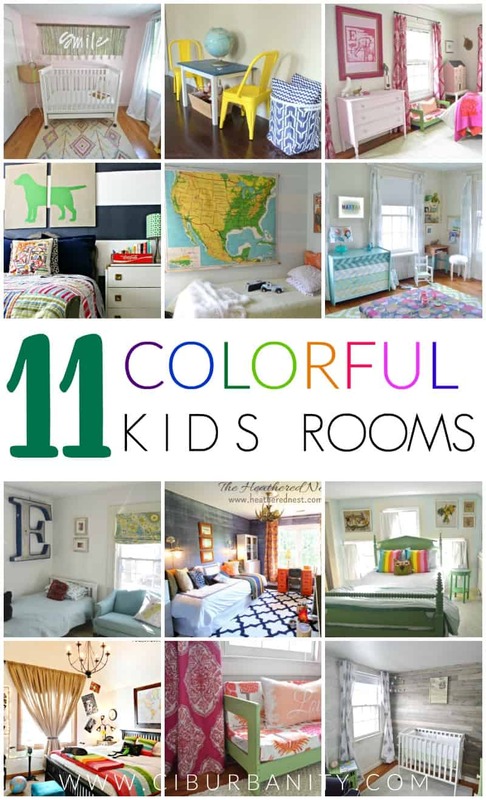 Eleven awesomely colorful kids spaces to inspire your next room makeover! Let me know how you do…I love to see readers’ projects! I love it, Julie! The lights… the globe… the bedding… so cool! And really fun to see how it’s growing with her!